Linn Post & Pipe Supply has been building one of the heaviest crowding tubs in the industry for over 30 years. These versatile units have a crowding gate that can be easily switched over to push cattle in either direction with minimal effort. 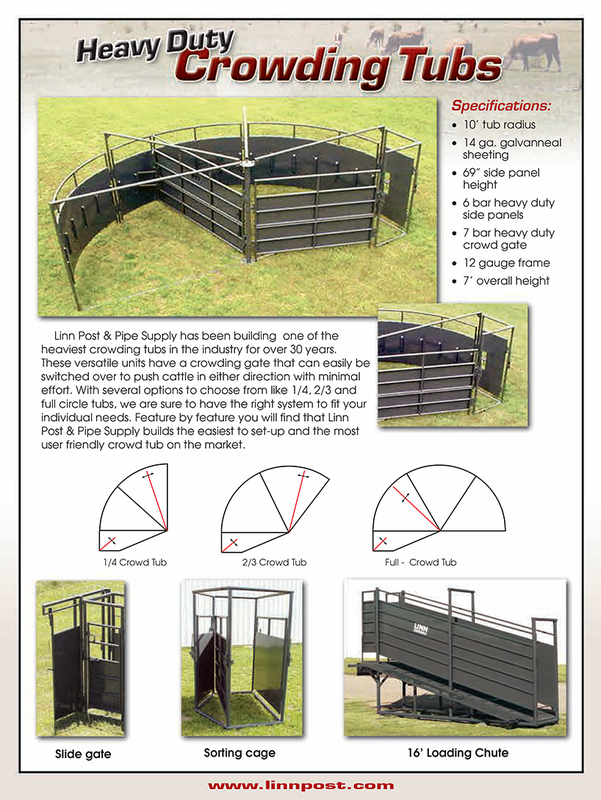 A Linn Post & Pipe crowding tub will help efficiently funnel cattle into the alleyway, reducing stress on the cattle and keep the operator safe from injury. With several options to choose from like a secondary crowd gate, 1/4, or 2/3 circle tubs, we are sure to have the right system to fit your individual needs. All our tubs are sheeted with heavy gauge material that is known to help reduce the stress on animals in a working situation. Feature by feature you will find that Linn Post & Pipe Supply builds the easiest to set-up and the most user friendly crowd tub on the market.